Sports-Fitness-Solutions Newsletter, Issue #030--Stay On Your Nutrition Plan, You Can Do It! Stay On Your Nutrition Plan, You Can Do It! Staying on your nutrition plan and getting fit takes some effort. There's no magic elixir that you can take to give you the lean, strong body you want. To get there you need to have the right workout program and the right nutrition plan to help you reach your goals; and you need to stick with it. I know at times it's tough enough to stay on your workout program, but I'm often asked why it's so difficult to stay on your proper diet plan. My answer is a simple one. First off we live in a society where food temptations are everywhere. Simply take a walk through any grocery store and you'll see unhealthy food items displayed everywhere, especially in the center of the store. Turn on the TV and you'll be assaulted with commercials for great tasting but fattening foods. Open a magazine and you'll see great ads for sugary snacks. Go down the street and you'll have restaurant signs screaming for your attention. See why it's so hard to stay on the program. Food is often used as a reward when we achieve a goal. Food is often used to comfort us when things get tough. Food often is often used as a stress relief when things become overwhelming. Fatty foods taste great and we like them, so they often become a habit that we enjoy. Sounds overwhelming doesn't it. It can be; but you can fight back by using the most powerful weapon you have; your brain. Your mind is an amazing thing. Once your mind is made up about something it is nearly impossible to change it. Defeating temptations for food is all about building negative associations in place of the existing positive associations you've developed for some foods. To defeat these temptations try this simple 2 step program to harness the power of your mind to win this food war. Step #1: - Create a Strong Negative Association with all the foods you know you shouldn't eat. Why shouldn't you eat these foods? They cause you to gain weight. They degrade your quality of life. They hurt your love life. Now every time that you encounter tempting food items simply focus on your list of negatives, and don't eat them. It's time to kick those cookies off their pedestal and to replace them with something healthy. It's really that simple, and you can do it. What do you love about healthy foods? They help builds your confidence. They enhances your love life. So there it is a simple solution to beat food temptations. Stay focused on healthy food. Shop the around the outside of the grocery store, not them middle. Browse the aisles of a natural food store. Walk through a farmer's market. Bring healthy snacks to work. Clear your kitchen of anything unhealthy. If you use this simple 2 step program you will soon find that healthy food is your favorite food. and the food that once tempted you will become a thing of your past. Now for some more good news to help you win the battle, it's called The "Domino Effect." Here's how it works. Regular exercise makes it easier to eat healthy. Just as healthy eating makes you more likely to exercise. It's the domino effect. When you begin to make a positive change in one area of your life other areas will soon follow. Remember, while nutrition is vitally important for weight loss and good fitness, true results are achieved through a combination of both nutrition and challenging, progressive exercise. So there it is. You can do it, you can achieve your fitness and weight loss goals. Just apply these simple steps and you will quickly on your way to a healthy and fit you. If you need any help or have any questions feel free to contact me at any time and I'll be happy to help. Untill next time "Remember Stay Fit You'll Feel Better!" You've probably heard of Quinoa - it is hailed by some as the new super food. It's high in protein (12%-18%) and contains a balanced set of essential amino acids, this means it's a surprisingly complete protein. It's also high in fiber and iron. 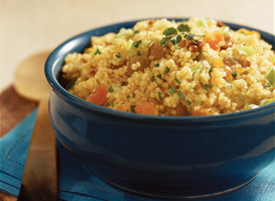 Quinoa is quite possibly the perfect breakfast to help you start your day off on the right foot. Find following a recipe I recently found that I enjoy. Give it a try and let me know what you think. Cook the Quinoa according to the instructions. Then top the cooked Quinoa with raisins, date pieces, pecan pieces, cinnamon, nutmeg and a drizzle of maple syrup. Nutrition Per Serving: 1 serving equals 1/2 cup of cooked Quinoa 344 calories, 5g fat, 59g carbohydrate, 6g fiber, and 12g protein.